It was cold and it snowed. But in the end it was some familiar issues that cost the Buckeyes again in the series finale with Iowa. Iowa City – Simply put, it was no day to play baseball, or the way to finish a road trip. 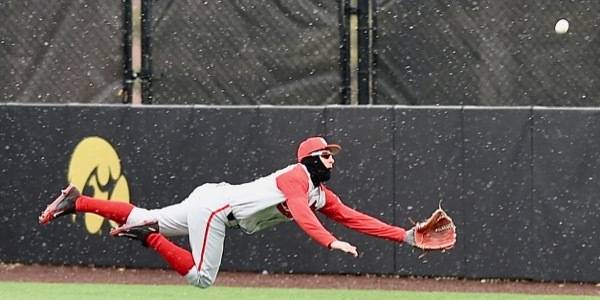 But play they did in 34 degree temperatures, a 15 mile-per-hour wind blowing out to left field…and in the seventh inning of Sunday’s game with Iowa it began to snow. By the end of the game, and a 2-1 series finale loss to the Hawkeyes, it was snowing in earnest! But they had their chances. The Ohio State Buckeyes, now 20-10 for the season and 3-3 in Big Ten play, had their chances. They got a gritty starting pitching performance by co-captain Adam Niemeyer, who wasn’t at his best, but he was good enough to carry a no-hitter into the fifth inning. In his five innings of work he gave up just one run (an unearned run), one hit, he struck out two, walked two, and hit two. They got a credible performance, once again, out of the bullpen, picking up for Niemeyer from the sixth inning on. Freshman Griffan Smith pitched 1.2 innings of scoreless baseball. 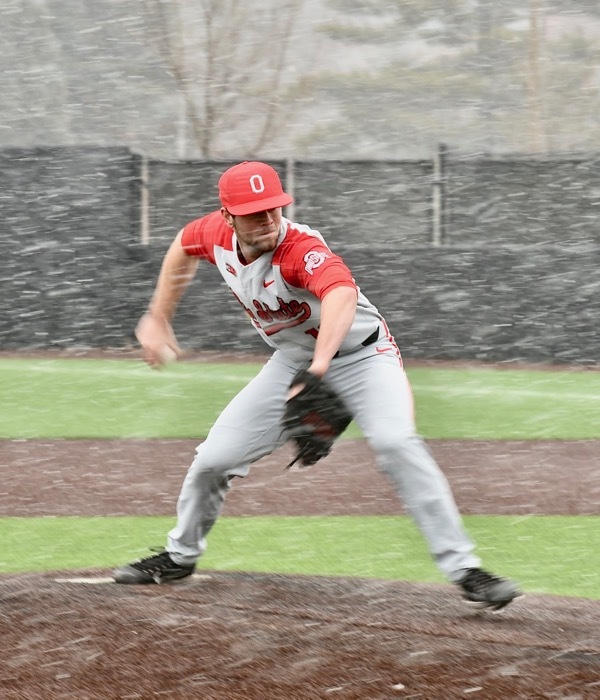 Kyle Michalik came on to relieve him in the seventh and into the eighth – and to pitch in the worst, by that time, of the falling snow. With two outs in the eighth Michalik gave up a walk to shortstop Kyle Crowl and a single to Justin Jenkins. Greg Beals came to the mound and summoned Seth Kinker, who surrendered a flair to left field from center fielder Grant Judkins, driving in Crowls, with what proved to be the game-winning hit. They got Noah McGowan’s seventh home run of the year, a laser shot in the fourth inning to left field that tied the game at 1-1. They had their chances to actually score the go-ahead run in the seventh, when Nate Romans and Jacob Barnwell struck out swinging with Tyler Cowles standing on third base. But they also were victims of their own identity, at least for now, when they allowed the game’s first run in the second inning. 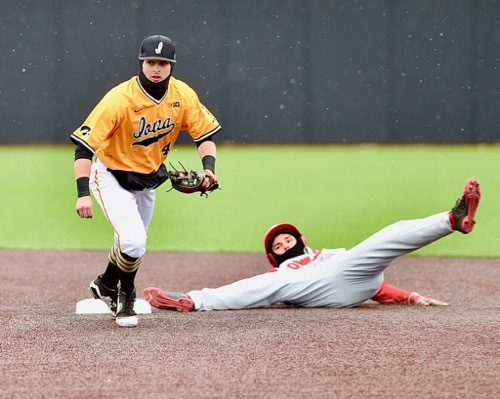 Iowa first baseman Matt Hoeg was hit by a pitch from Niemeyer, advanced to second on an error by Noah McGowan, and eventually scored on a sacrifice fly to center field by Crowl. Touch ’em all…Noah McGowan slaps hands with coach Greg Beals after his game-tying homer in the fourth. It was 1-0 until McGowan’s home run in the fourth tied it at 1-1. And it stayed that way into the fateful eighth…largely because the Buckeyes were bitten again by the strikeout bug. Iowa starter Cole McDonald struck out eight in his six innings of work; and reliever Zach Daniels K’d three more over the final three innings. Eleven of the Buckeyes 27 outs came without benefit of contact with the baseball. Their final line score: 1 run on just 4 hits, 2 walks, and just 4 men left on base. Kyle Michalik was the tough luck recipient of the loss, his first (0-1) of the season. Five Star Painting is proud to sponsor coverage of Buckeye baseball on Press Pros Magazine. com. In the end…it was simply a disappointing outcome, complemented by miserable playing conditions – particularly hard for Greg Beals to swallow given the quality of the pitching, along with the matter of the strikeouts and a pair of ‘free’ bases given up that eventually cost them the game. “We got a good pitching outing from everyone who worked today,” he said in his post-game remarks as the winds and snow gathered intensity. “Obviously it was a tough day to hit, but we had a couple of opportunities to get a bunt down, a man over – play some ‘small ball’ – and we couldn’t do it. Outfielder Dom Canzone came up short of catching this foul ball in the seventh inning of Sunday’s finale in Iowa. Games like this HAVE to be won, if you’re going to win, because the conditions warrant it. They’re bad for both teams. 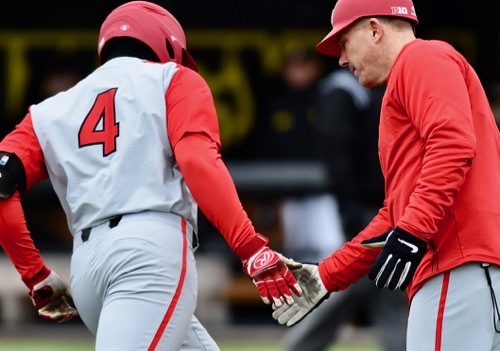 But the Buckeyes’ inability to make Iowa work – those eleven strikeouts on offense – loomed larger and larger as the game progressed and the weather conditions degenerated. The McKinley Funeral Home of Lucasville, Ohio, proudly supports Ohio State Buckeye baseball on Press Pros. The weekend marked the third consecutive high-stress series in conference play for Iowa, the Hawkeyes already having played Indiana and Illinois. Iowa coach Rick Heller was no doubt pleased to have escaped with another series win against elite conference competition. Loose defense cost the Buckeyes again, as this second inning error led to an unearned run by the Hawkeyes. And the model by which they won two of three had to be a poignant reminder for Beals and his coaching staff. 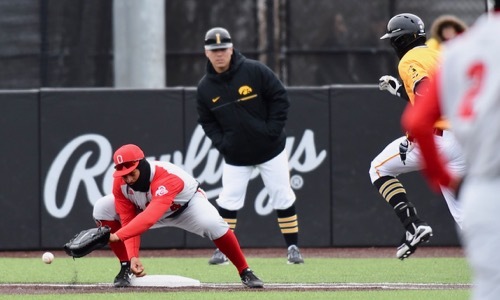 The Hawkeyes only had 5 hits Sunday, but made the most of them while committing just one harmless error in the second inning. As Beals has said from day one, while being 20-10 currently, and 3-3 in conference play, there’s plenty of room for improvement. Kobie Foppe was cut down stealing second by Iowa’s Kyle Crowl in the sixth. And as well, there’s incentive to find solutions for their recurring issues before next weekend’s series against Penn State, a series that the Buckeyes need to take confidently, and convincingly. The Nittany Lions are just 7-18 overall, and 1-8 in the Big Ten. They were swept this weekend by Minnesota…7-6, 17-2, and 8-2. And that time is nigh, as believe it or not, they’re already four games past the halfway point in their season. They weren’t very happy as they got back to their hotel Sunday afternoon – miserable would probably best describe it. The snow was falling harder and the weekend was nothing to write home about; and they couldn’t even get home because the team charter had to be postponed until sometime Monday. They’ll put the time to good use, as they have no choice. They’re scheduled to meet Ohio University on Tuesday at Bill Davis Stadium. They’re eager to play, they want some better weather, and to be that team again that banged out 21 hits last Sunday against Nebraska. They’ve had a month’s worth of miserable…in just one weekend! United Building Materials is proud to sponsor coverage of Buckeye baseball on Press Pros Magazine. com.